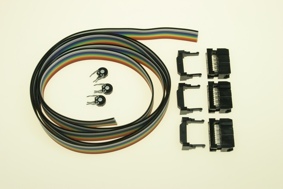 Schulze cable kit for LipoCard balancer. Schulze new Lipo Card . 1-4 cell charger with true cell balancing built in . Includes PC interface port, just connect via PC cable (not included) and be able to view charging graph on screen, show voltage of PAC and individual cell cell voltages if using balancing cable. the included cell balancer is a true balancer not a limiter as used in some other balancers . Lip cards genuine balancer which analysis the cells connected to it, and matches them to each other after the first minute of charging. The result: faster matching of the cell voltages, faster full detection, reduced heat generation.